100% cotton kitchen towel with Baton Rouge sky line design. Matching pot holder also available. Thick cotton pot holder with Baton Rouge skyline design. Matching kitchen towel available. 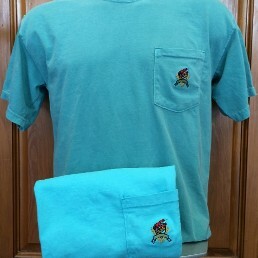 100% cotton t-shirt with embroidered Baton Rouge logo across the chest. 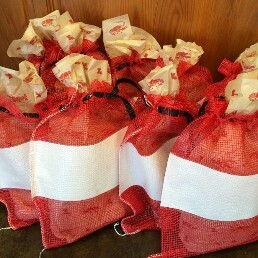 Now you can make your favorite cookies in the shape of fleur di lis, crawfish or alligators. All aproximately 5in. 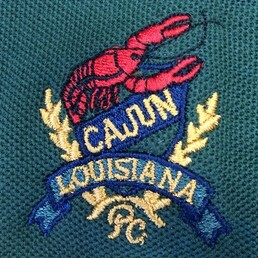 100% cotton dish towel with embroidered Cookin' Cajun logo. 100% Cotton long sleeve button down oxford with embroidered black & gold Fleur de Lis on the left chest.